Leroy Sadler, age 83, passed away on Thursday March 29, 2018. He was born on May 14, 1934 in Jamesport, MO to Earl and Lena Sadler. He was the youngest of eight children. 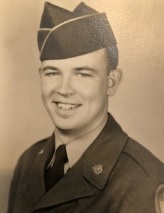 In 1956, Leroy began a career as a barber and was drafted into the Armed Forces where he was stationed at Ft. Sill, OK. That same year he married the love of his life, Mary Lou Madison. He was then stationed in Germany for 18 months. Leroy came home to his career as a barber and later also a shop owner, retiring in 1999. Leroy loved to watch the Royals games and KU Basketball. He loved to garden. He was a very proud grandfather and loved to spend time with his grandchildren. Leroy is survived by his wife, Mary; son, Doug (Linda) Sadler; daughter, Debbie (Tony) Whalen; grandchildren, Jason (Sophie) Sadler, Kevin (Sarah) Sadler, Benjamin Whalen, Anthony Whalen, and Lexi Whalen; sister, Jewell Walley; and numerous nieces and nephews. He was preceded in death by his parents and six brothers, Carl, Eugene, Guy, Darrell, Junior and Virgil. Visitation for Leroy will begin at 10:00 am, followed by a service celebrating Leroy's life at 11:00 am with Pastor Sean Hoeflicker officiating, on Tuesday, April 3, all at Park Lawn Northland Chapel, 1640 North State Route 291, Liberty, MO. Burial will follow in Glenridge Cemetery, Liberty. In lieu of flowers, memorials may be given to Honor Flight (honorflight.org).